Soma Suresh Kumar is the founder of Sumo Group. His ambitions and vision has made the Sumo Group a brand name in Biscuits Manufacturing. The Chairman is of the view that leaders are not made or born. Leadership is a choice, a belief and commitment to everything that is good and noble within you. He is a man with vision and innovation. He believes in hard work and consistency and advocates that one should always do ones best and never bother about the result. If the performance is good, the result will automatically drive you to the number one position. His suggestion to the staff always been ---- The highest reward for a person's toil is not what they get for it, but they become by it. The price of greatness is responsibility. Love what you do. Do what you love. He is of the opinion that a busy man always finds time and should not shirk work attributing to lack of time. He believes that one cannot escape the responsibility of tomorrow by evading it today. Ramakanth Soma is a man of principles he is an able administrator. He is well known for his innovative thinking and positive bent of mind. 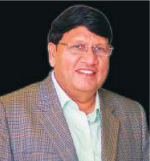 He has been in the continuous limelight for introducing advanced packing technology in the Biscuit Packaging segment that has created a niche in the market. He has ably steered the company through his determined approach and is a firm believer that all problems have solutions if an analytical approach is used. A shrewd thinker and a person of noble character, he generates a tremendous flow of positive energy. A man of boundless energy and dynamism, with a taste for challenging assignments, he is a Management graduate with specialization in marketing and has a penchant for attending many management and personality development programs to update himself on the latest knowledge domains.He is known for contemporary ideas blending superbly with conventional wisdom.